See what the pen can do! My poem. 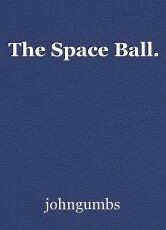 Inviting me to a space ball. As if I really care. I was there to enjoy, and not to fear. And up to the King. She's neither too thin, nor too fat. Grafgging his iron feet across the floor. ''There's some one missing,'' I said. Looking around and scratching my head. ""it is the sun,'' some one cried. Entrance, we couldn't have him near. Mer cury is chatting his head away. Saturn will make the day. Uranus is close to Venus, too close. Neptune is like a glass, where you can see through. Start stamping your foot, when you get the cue. And also the daughter of hell. I still had time to yell. Can I take her back to earth. And a timing for your re-birth. This page was created in 0.3136 seconds.